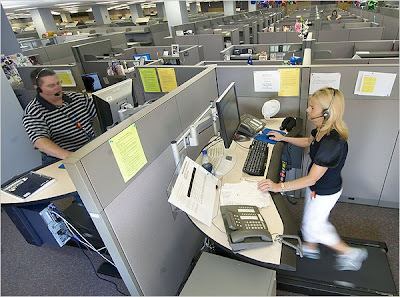 Treadmill desks hit the big time (the New York Times). Promoted by Dr. James Levine and his NEAT (non-exercise activity thermogenesis) team as an easy means to combat obesity and adopted by world famous bloggers like bookofjoe's Joe (check out the picture down below to see Joe on his desk) now you can buy one from office furniture maker Steelcase for the not-so-low price of $4,000. The way it works is pretty straight forward. Instead of sitting, you walk. Apparently walking at up to 1.5 miles an hour generally doesn't cause you to break a sweat and still allows you to type, mouse and talk normally. 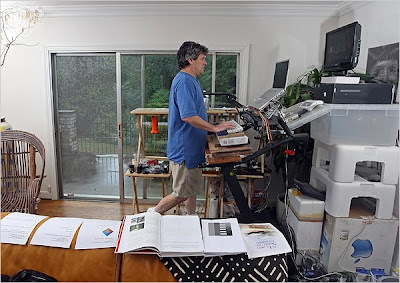 If you're interested, instead of forking out the big bucks pick up a used treadmill with arms on your local Kijiji or Craig's List and jerry-rig your own version on the cheap. When Obama Wins I'll Eat your American Brains! Clean Your Plate Club Members Eat 35% More! Calories on Menus All Across America? Can you Eat like an Antarctic Explorer? Jamie Oliver's Latest Great Idea (Must See TV)! All the Rocky Movies in 5 Seconds Flat! I Say Something Nice about KFC! Disband the Clean Your Plate Club!